New Melbourne Browncoats, Inc. | More Live Auction Items for Saturday’s Can’t Stop the Serenity event! Can’t Stop the Serenity Schedule for Saturday and Ticket Update! Autographed Collectibles Online Auction starts at 8pm tonight! More Live Auction Items for Saturday’s Can’t Stop the Serenity event! We’re auctioning off a fantastic Dollhouse Collection at Can’t Stop the Serenity Melbourne on Saturday! 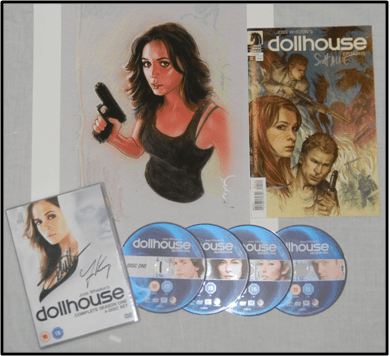 The collection includes a Dollhouse Season 1 DVD signed by Eliza Dushku (Echo/Caroline) and Fran Kranz (Topher), a gorgeous “Echo” art print signed by artist Jason Palmer and a copy of the Dollhouse Epitaphs one-shot comic signed by Dark Horse Editor Scott Allie! Each signed item comes with a Certificate of Authenticity, verifying that the autograph was obtained in person by an NMB volunteer. We’re only taking bids at the event, so get your ticket today at bit.ly/csts2014. All proceeds will be donated to Equality Now and help young girls and women around the world seek justice and a better life.